Heliconias are also known as “lobster claw” plants because of the distinctive bracts protecting their flowers. The flowers clusters come in both hanging and upright varieties. Heliconias range in size from waist high to double overhead with giant banana-like leaves. The flower’s clusters come in different shades of red, orange, yellow, and green, and are a favorite hideout for green geckos. 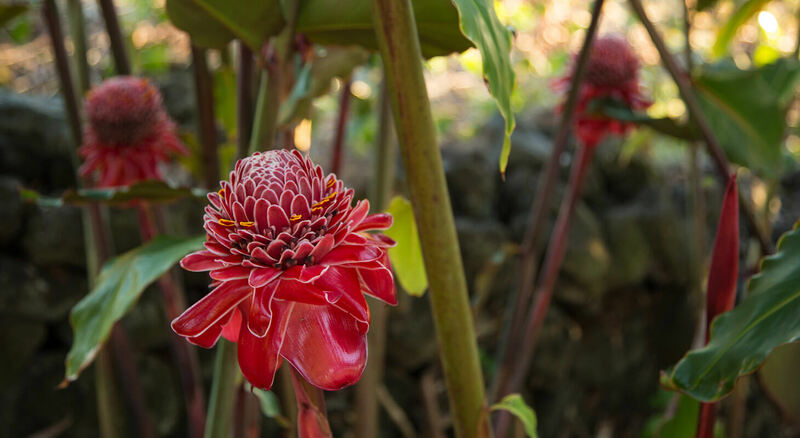 You can find heliconias all over the estate of our Big Island bed and breakfast, with some excellent examples growing right along our driveway. Bird of Paradise is one of Hawaii’s most iconic flowers. The bright orange and iridescent blue of its petals are immediately recognizable and evoke the vibrant and exotic plumage of the birds-of-paradise of Papua New Guinea and Indonesia. 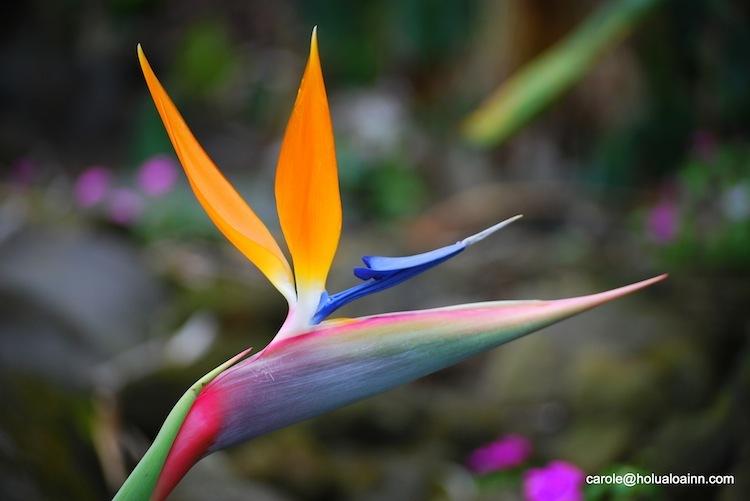 The Bird of Paradise is an all-time favorite among locals and visitors alike, and it makes for an excellent stand-out piece in wedding florals. Birds of Paradise are conspicuous among the flowers along our driveway circle. Proteas are a truly unique variety of flowering plants that originated in South Africa. 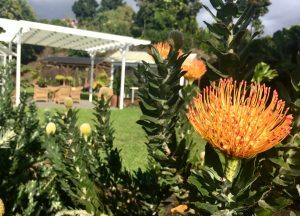 The flowers of the “pincushion” proteas growing on our property look other-worldy, more akin to Hawaii’s native Lehua blossoms than to many of the other exotic flowers that have been brought here from around the globe. That is because the “pins” in the pincushion are actually the extended pistils of a large cluster of flowers, which make up the base or “cushion.” You can see these bright orange and yellow flowers for yourself on the north side of the estate below our nursery. While ginger flowers come in an unbelievable array of forms and colors, the torch ginger might be the most impressive of all. 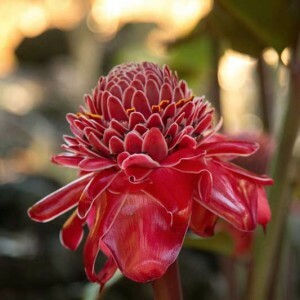 The plant itself grows to double-overhead height, and sprouts a separate flowering stalk which evokes a wizard’s knobby walking stick just before it bursts into a fireball of feathery, bright-red petals. The flower looks best just after opening, but continues to grow and produce new color even as the older petals fall away. Cut torch ginger flowers make an excellent decoration when tied to columns or posts. Our signature flower, you can find them along the walking path on the south side of our driveway and in a beautiful mosaic tile design at the bottom of our swimming pool. 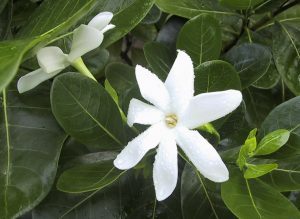 The tiare is a Polynesian variety of gardenia, and it bears the same intoxicating fragrance as its more widespread cousin. The simpler blossom of the tiare typically has five to eight petals arranged in a pinwheel. It makes for an excellent adornment when braided or pinned into hair, not least of all because it will perfume anything in its vicinity. Several tiare shrubs can be found on the lawn below the Inn between the pool and the Hale Luana pavilion. Everyone knows orchids, and many of you may even have them growing in your homes. Orchids love Hawaii, where they are constantly caressed by warm breezes bearing moisture to nourish their hanging roots. 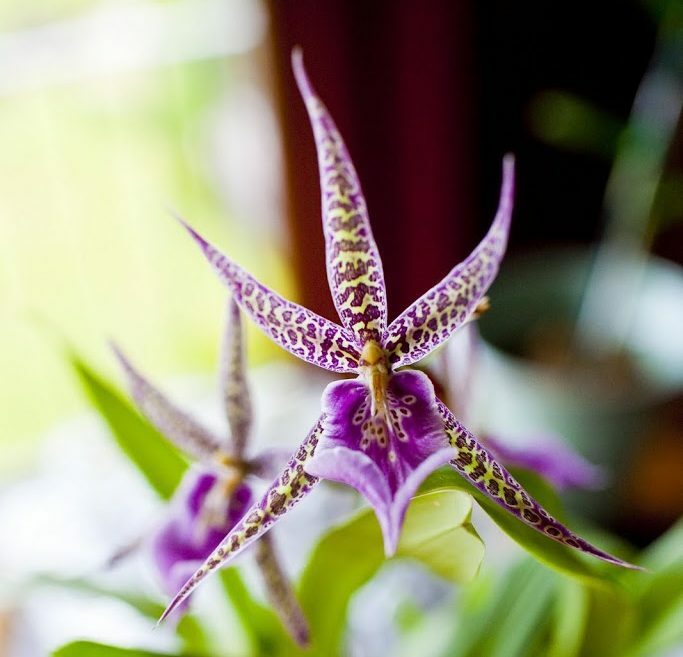 Throughout the Inn you will find orchids in almost every room. Beyond the standard, but beautiful, Phalaenopsis, you will find clustered Dendrobiums, sprays of delicate Oncidiums, and spidery Brassias. If there is one flower that is more iconic than the Bird of Paradise, it is the ubiquitous Plumeria. 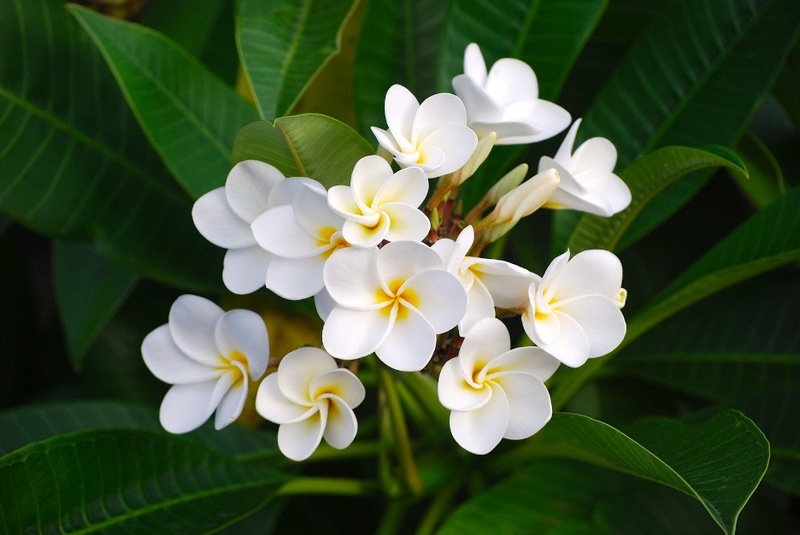 Plumerias are the standard for traditional leis that are used to greet visitors to Hawaii. Plumerias come in striking color combinations, such as bright white and yellow, pink and orange, and dark red tipped with pink. They can be found throughout the Holualoa Inn estate, and are used to line the aisle at wedding ceremonies at our Malulani Pavilion. 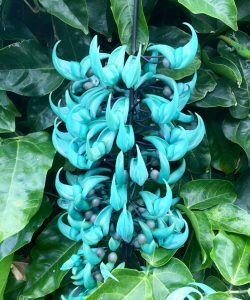 The flowers of the blue jade vine have a luminescence of their own; even on a cloudy day they look to be glowing from within. Blue jade is made even more special by its ephemeral nature. The flowers only last for a few hours when they are plucked from the vine. That is why they are reserved for only the most precious lei. Here at the Inn, we have a spectacular jade-covered trellis set on the lawn below the Inn that makes for an unforgettable backdrop, especially for an elopement, vow renewal or wedding photos.